December 3, 2008 | Ever feel like there is nothing going on in Cache Valley? Think, as students, that there is no time to do anything else but study and worry about classes and grades? Tim Ray, student at Utah State University originally from northern California, felt this way too one Tuesday, mid-October 2006. He was swamped by school, stressed out, questioning why he came to Logan for school, late for a chemistry lab, and to top his day off . . . it was snowing. Unable to take anymore he called up some buddies on a whim and invited them to come play some football on the Quad. Much to his surprise, about 15 people showed up. It continued to snow as they threw the pigskin, taking all their stress, aggression and worries out on each other . . . full tackle. After the first historic game, everyone was all sweaty, wet, sore, some bleeding, and all wearing huge smiles on their faces. It became a weekly release for them . . . a physical outlet in their lives of tedious structure. And best of all . . . it was fun! 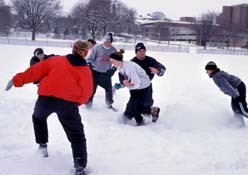 The Ice Bowl, as it affectionately became known as, continued on the Quad every Tuesday in the winter of 2006-07. When the snow melted, Ray wasn't about to give up and surrender to the mundane life of Logan. He started a group called Cache Valley Summer Sports on Facebook so there would be an easy way to tell anyone or everyone about what sports are going on during the summer. The group includes 116 people and allows anyone to join. Ray as it's administrator, kept tabs on all the sporting events happening in Logan during the summer such as soccer, football, softball, tennis, basketball, ultimate frisbee, wakeboarding and anything else happening in the sun. Now that it's fall again, Ray gets the boys out playing "pre-season" Ice Bowl, again on the quad every Tuesday at 4 with full intention of starting up the new season of the Ice Bowl when it snows. Everyone is invited so come on over! Beware, that you will get tackled, it will be cold, and it will be fantasticly fun. "Meh, I did fail that chemistry lab that I was late for and had to retake the class," said Ray, "but it was definitely worth it. The Ice Bowl gets people together to forget about the cold, hit each other, and have an all around good time!"